Det er onsdag, og min dag på Dream Team-bloggen til Mo Manning. Dagens kort er publisert i juninummeret av Ett trykk, der vi hadde en artikkel med fokus på pynt av alle fire sider på et kort. Jeg pynter stort sett alle sidene på kortene mine uansett, så dette var hjemmebane for meg. It’s Wednesday and my day on Mo Manning’s Dream Team blog. Today’s card was published in the June issue of Ett trykk, which featured an article focusing on decorating all four sides of a card. I usually decorate all the sides of my cards anyway, so this was home turf for me. Jeg har fargelagt Mummu med Copics og så stanset ut panelet med en ovaldie fra Kort & Godt. Papirene jeg har brukt er Exuberance of flowers in bloom og a Romantic picnic in the Park fra Sofiero-kolleksjonen til Maja Design og Cuddly fra Vintage Baby-kolleksjonen. Bannerne er stempler fra Bitty Banner-settet til Waltzing Mouse Stamps, og jeg har pyntet enkelt med knapper fra Papertrey Ink. I colored Mummu with Copics and diecut the panel with an oval die from Kort & Godt. The papers I used are Exuberance of flowers in bloom and a Romantic picnis in the Park from the Sofiero collection by Maja Design and Cuddly from the Vintage baby collection. The banners are stamps from the Bitty Banner set from Waltzing Mouse Stamps, and I embellished just a little bit with buttons from Papertrey Ink. 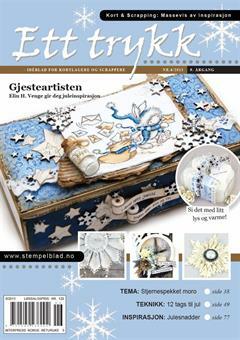 Den lille “Hurra”-teksten kommer fra et stempelsett fra Norsk Stempelblad AS, annengangsstemplet med Autumn Rose blekk fra Papertrey Ink. De små sommerfuglene har jeg punchet ut med en Martha Stewart-punch i både kartongen og det ene mønsterarket. Jeg har brettet vingene på mønsterarksommerfuglene tilbake for at den mørkere kartongen skal vises. Som kropp har jeg brukt bittesmå perler fra Kort & Godt som jeg har limt på med Multi Medium Matte fra Ranger. The little “Hurra” text is from a Norsk Stempelblad AS stamp set, using second generation stamping with Autumn Rose ink from Papertrey Ink. I punched the little butterflies using a Martha Stewart punch in both the cardstock and one of the patterned papers. I folded the wings of the patterned paper butterflies a little bit back to showcase the darker cardstock a little bit. As the bodies I used tiny pearls from Kort & Godt that I glued on using Ranger Multi Medium Matte. Innsidene har mer eller mindre samme oppsett, men jeg har pyntet så det ikke blir helt likt. I used more or less the same layout on the insides, but I embellished them in a way to make them a little bit different from eachother. Bursdagsteksten kommer fra North Star Design og er stemplet med den samme stempelputen som jeg har brukt ellers. Den eneste forskjellen er at stemplingen her er i full styrke. The birthday sentiment is from North Star Design. I stamped it using the same stamp pad that I used for the rest of the card. The only difference is that the stamping here is the full strength. Carpe diem-stempelet kommer også fra North Star Design, det er et av stemplene på Lykke-platen. Det er fremdeles den samme stempelputen som er brukt, bare annengangsstemplet igjen. The Carpe diem stamp is also from North Star Design, still the same ink pad, but using second generation stamping again. Flere bannere og sommerfugler på baksiden, og nok en tekst fra North Star Design. More banners and butterflies on the back of the card, and another North Star Design text. As usual I finish with the colors I’ve used for my image. I also used R80, which is a color I’ve made myself.